So what's a girl to do? Well, I really cannot decide. Like, trying to pick two large, vertical, aesthetically similar pieces to hang side-by-side on one wall is giving me anxiety as I have never known. Not too feminine, not cliche, not too crazy-looking, but also not expensive. The non-solution? Society6. You guys, I am obsessed with this web site. I have spent hours browsing their art prints, and have found so many options. 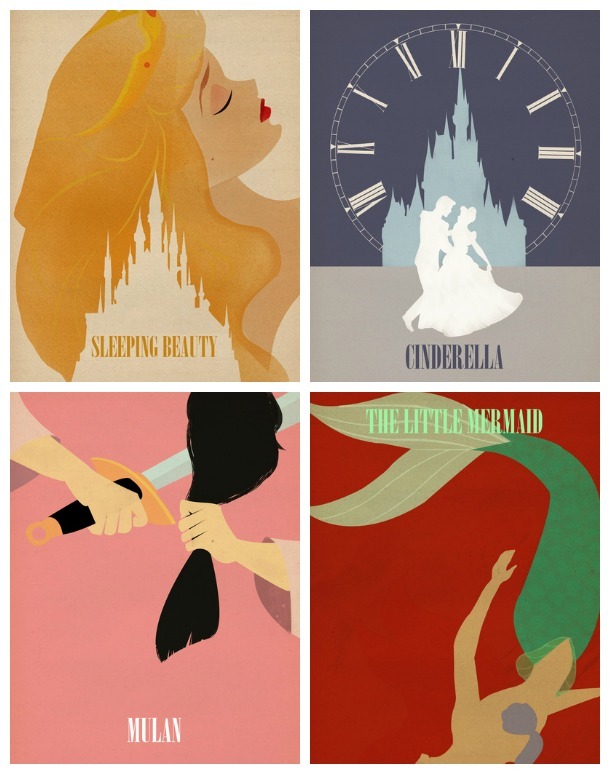 Which brings me to the above selection of fun Disney princess-inspired prints. As a little girl (awww) I loved Sleeping Beauty and The Little Mermaid so much. Too little-girly? Just right? I have no idea. I told you guys, anxiety. Help! Omg!!! I'm such a lover of the arts, these prints are awesome! I love unique illustrations such as these! You're right Society6 is a great site showcasing many amazing talents! I'm hoping one day to be a part of that group! Disney is all.over.the.place right now. I am loving these prints! I think that the Cinderella option would go great on my gallery wall I'm cooking up! Too cute! Love The Little Mermaid print!